Move the lever (B) upwards or downwards to achieve the required height. IMPORTANT Adjustment must be carried out only seated in the driver’s seat. To adjust, turn the knob (D). Press button (A) to switch the seat warming on/off. The led on the button will light up when the function is on. when the car is stationary. the lever, check that the seat is firmly locked in the runners by trying to move it back and forth. 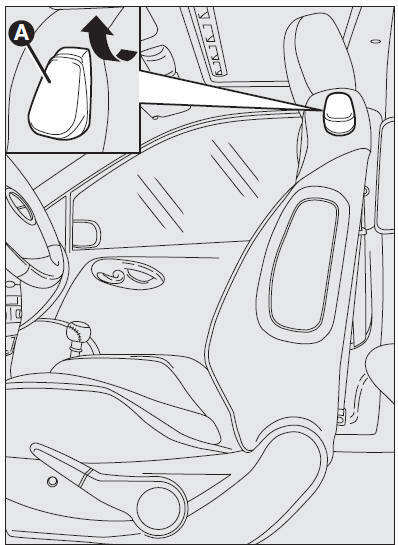 Failure to lock the seat in place could result in the seat moving suddenly and the driver losing control of the car. To gain access to the rear seats, pull the handle (A) upwards, the back rest folds and the seat is free to run forwards. When resetting the back rest, the seat returns to its original position (mechanical memory). Always check that the seat is firmly locked in the runners by trying to move it back and forth.